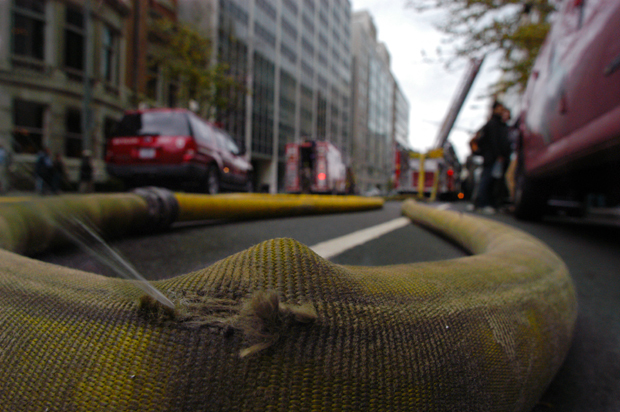 There was a small fire in the building adjoining Corcoran College's H St NW campus. I was sitting in class. We were just getting into this video about Buddhist dance from India. It appeared it might have been a very interesting video. The fire alarm rang. We all gathered our stuff and walked out to the sidewalk. After about five minutes we were back in class watching the video. A couple minutes later, after seven fire trucks pulled up and blocked the street off, we were all back on the sidewalk. I guess they were responding to a minor fire in the connecting building bacause we could smell smoke but afternoon classes resumed. We never got to watch that video. We had to leave class early.